HOMEAHOLIC: A Few Pieces of Indispensable Advice: It's on the House! A Few Pieces of Indispensable Advice: It's on the House! Whether you’re moving into your first home or moving home for the first time in years, getting from A to B can be pretty intimidating. After all, you have to deal with the ordeal of house hunting, bartering and nights of restless sleep while you wait to find out whether you have a deal or not. Then, once that stress is over, you don’t even get a chance to kick back and relax for a bit before you have to pack your whole life up into boxes and get settled into a strange new environment. It’s not surprising that so many people put this experience off, sticking where they are rather than taking on the stress. However, it’s so important to remember the light at the end of the tunnel! 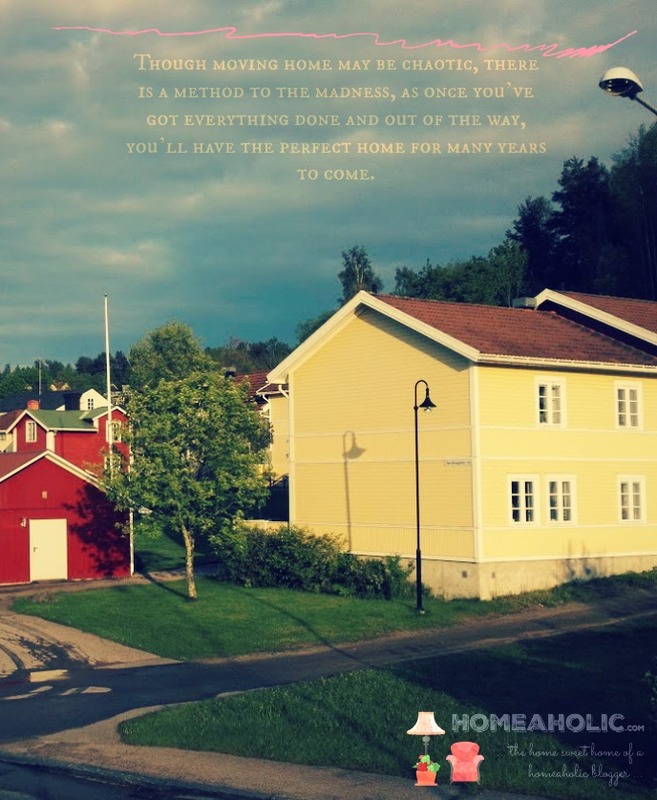 Though moving home may be chaotic, there is a method to the madness, as once you’ve got everything done and out of the way, you’ll have the perfect home for many years to come. Remember that there are a few ways to make things easier for yourself. So, if you’re looking for some words of wisdom on the moving process, you’re in the right place. Stick with us as we guide you through every step. First things first, how do you know that the time has come to move? Well, your current home will start to feel a little less than homely. As soon as your home begins to feel uncomfortable, or you yearn for more, this is the time to start considering a change. Here are a few common reasons that cause people to up and move. Many of us start out by moving out of our parents or carers’ houses and moving in with friends in shared accommodation. This is a great way to ease into a more independent mode of living. You have more independence and freedom, but don’t have to live alone. However, as years go by, you’re likely to start considering moving into your own space. So, say goodbye to cleaning rotas and noisy housemates and start considering a place of your own! A second reason that people tend to consider a move is because they want to shift from renting from a landlord to buying a property of their own. This is completely understandable. Renting is great if you’re likely to move often and are still exploring the world. But if you want to settle down, you might as well be putting your money into something of your own. As years go by, the number of people living in your home or the amount of belongings that you accumulate are likely to change. Perhaps you gain a partner, kids or pets. You’re likely to need to upgrade to a bigger place where there’s more room for everyone to live comfortably. Maybe you have managed to purchase more furniture and appliances and could do with a little more space to arrange them in. It’s time to size up again! Alternatively, you might have moved into a space that is too big, and you don’t have the time or effort to clean every room thoroughly or simply have too much disused space. In this case, you’d do well to move into a smaller property. Generally, people’s income will grow as the years go by. They will want to spend their cash on a larger or more lavish property. Especially if they can afford larger repayments on a mortgage or a larger housing loan. On the other hand, some people decide that they want to work less and opt for fewer hours, seeing a significant drop in their income. In this case, they are likely to want to move to a cheaper home that costs less to maintain. As people age, they may not be as mobile as they used to be. For this reason, a lot of the older generation switch from a house or apartment with stairs into a bungalow. The same goes for individuals with certain disabilities. This allows more ease of movement and easier access to all rooms in the building. So, if you’ve decided it’s time for a change of scenery, for whatever reason, you’re going to need to start considering where you’d like to move to. Deciding where to move is a huge task in and of itself, so it’s always useful to have a little checklist to go through to whittle down your options. Location is everything. Early on in the process, it’s best to decide on an area that you can see yourself living in for a long time. Ideally, you’re going to find somewhere as close to your loved ones and your job as possible. Either that or you should have a new job at a different location at the ready and be comfortable with seeing a little less of your loved ones. You should check out the local amenities in the area you’re considering. This can include entertainment, health and sports facilities, transport links, schools [if you have little ones] and shopping. If you like to engage in certain activities regularly, it’s best to opt for a home where they are extremely nearby. This will save you the time, effort and cost of travelling regularly. Check out the criminal record for any area before browsing the properties. You want somewhere as safe as possible. Obviously, this will alter according to your budget. But there are certain areas with affordable housing and extremely low crime rates. Your safety should be key at all times. Once you’ve decided the whereabouts of the place you’d like to live, it’s time to start house hunting. There are a few different ways to go about this. Perhaps the simplest and most convenient is to use an estate agent or realtor. Individuals who are selling or renting their home are likely to use these to advertise so you can find the widest range of properties on their site or in their books. You will have to pay a fee for their services, but they will lift the weight of the moving world from your shoulders, so more often than not it’s worth the expense. So, once you’ve found a few estate agents operating in your area of interest, here are a few things to discuss. We can not emphasise enough the importance of viewing a property in real life before setting your heart on it. Remember that while estate agents are there to help you, they are also there with the motive of selling and letting properties as quickly as possible for maximum profit. So it’s not all too surprising that they will almost always use the most flattering angles, lighting and descriptions possible. These can often be deceiving, so it’s always best to actually visit a property before taking any further steps. If your chosen area is far from your current location, book a few viewings in for one weekend and make the trip to take a look around. This will cost you less and allow you to get all of your viewings out of the way in one sitting. If you are planning on renting, you will want to engage directly with the landlord before signing any contracts or making any deals. After all, this is the person who’s going to be responsible for maintaining the property while you live in it. You want to ensure that they are easy to communicate with, vigilant and fair. Suggest a phone call or face to face meeting so you can get an idea of their characteristics and traits. Sticking to these pieces of advice will drastically improve your chances of landing the property of your dreams sooner rather than later. So, get out there and start searching!